It may come as a surprise that the three best-selling vehicles in America last year were all full-size pickups. In fact, trucks have topped sales charts for decades. The gap in units sold isn’t close, either – the 30-year sales king, Ford’s F-150, was purchased more than twice as many times in 2018 as the highest volume passenger vehicle, Toyota’s RAV4. The reason pickups trounce their SUV and sedan rivals is their comparative versatility. A pickup can fill the role of family hauler, work vehicle, road tripper, and everything in between. A sedan or crossover, meanwhile, is limited by its size, configuration, and durability. And while passenger vehicles can improve their utility only modestly, trucks have proven their adaptability to comfort and luxury – none more so than Ram’s 1500. With the introduction of the fourth-generation 1500 in 2009, Chrysler wagered that interior quality and technology would prove just as important as performance. After numerous model year updates, the company’s efforts began to yield results, surpassing the Chevrolet Silverado 1500 in sales last year. Now, with the introduction of a fifth-generation 1500, Ram is gunning for Ford’s crown. The 2019 Ram 1500 continues its campaign for comfort with improved ride quality, better interior materials, and class-exclusive technologies. With the availability of a mild hybrid system for both V6 and V8 powertrains, the truck also makes a critical efficiency play. Our test of both the standard ($37,985) and eTorque-assisted ($39,435) Hemi V8 models reveals Ram’s command of a fiercely competitive segment. The outgoing Ram 1500 (which is still being sold through the 2019 model year) is a handsome truck with clean lines and a powerful stance. Thankfully, while a complete redesign, the new generation doesn’t disrupt the old truck’s curb appeal. Gently re-sculpted panels, sharper light signatures, and a narrower, wider grille soften and modernize the pickup. These styling tweaks mean even low-end versions of the new 1500 are less utilitarian than before, while upscale trims look downright classy. A wide range of wheel choices, colors, and exterior trim packages change the truck’s look dramatically. Those averse to glitzy chrome will want to equip either the sport or blacked out appearance kits, which matches the 1500’s front fascia to its body paint. 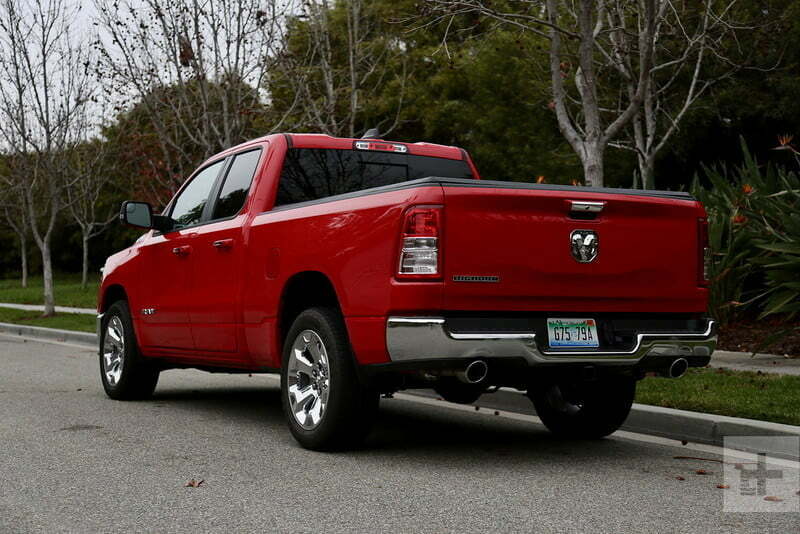 Badging is modest for full-size trucks, with RAM spelled out on the grille, 5.7-liter HEMI plates on either side of the hood, and a 3D Ram icon on the tailgate. Even models equipped with the eTorque system lack any ancillary badges – a welcome change from the “hybrid”-plastered pickups of old. Design tweaks mean low-end versions of the new 1500 are less utilitarian, while upscale trims are downright classy. If it’s been a while since you peered inside a pickup cabin, the new 1500 will have you scratching your head. 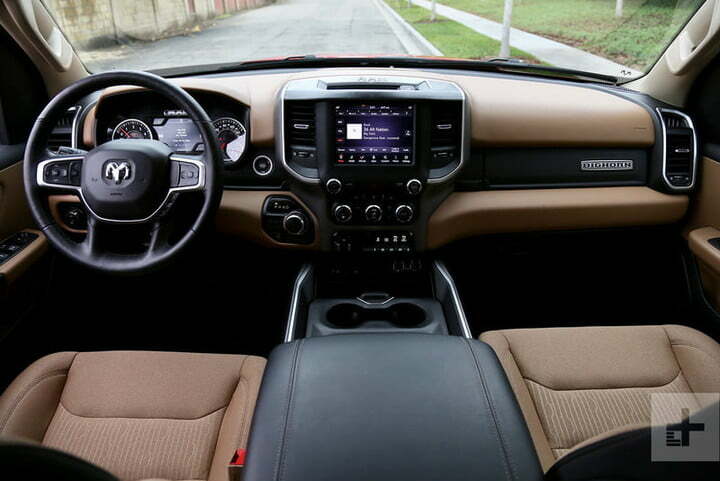 Apart from the familiar sense of space, nothing about Ram’s interior design can be compared to trucks from a decade ago. A sculpted dashboard, large screens, textured and soft-touch materials, and attractive seats welcome passengers into the modern era. Furthermore, button layouts and interior storage solutions, are intuitive and easy to access. 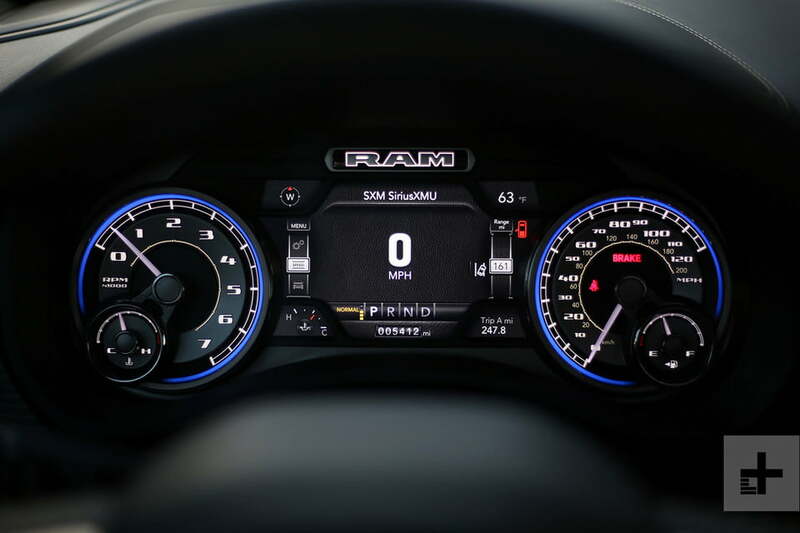 A reconfigurable, highly versatile center console, smartphone cable management, and molded door cup holders show off Ram’s attention to detail. Visibility out of all windows is superb. Front and rear seats – available in high-end cloth or leather – are comfortable and supportive. 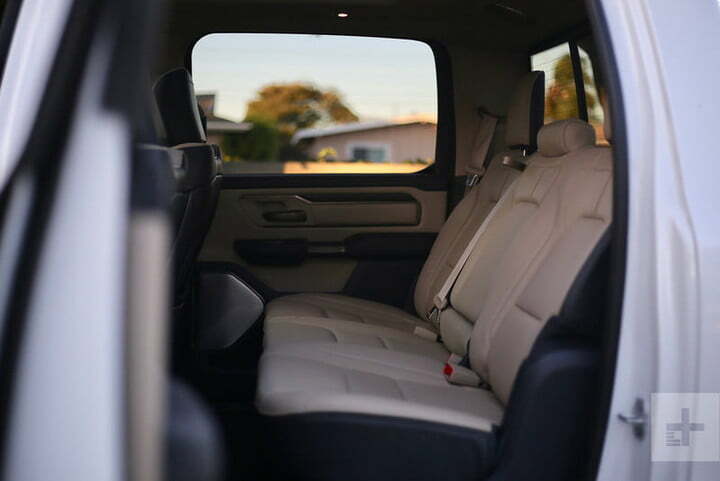 Our only admonishment is for those who plan to host full-size adults on a consistent basis: quad cab models don’t leave much legroom for rear riders, so we recommend choosing the crew cab configuration. Ram was good enough to offer both Big Horn and Laramie Longhorn versions of its new truck to let us play with standard and upscale convenience features. And, not to spoil the surprise, but even the mid-range Ram is more tech-rich than the most premium versions of all its rivals. 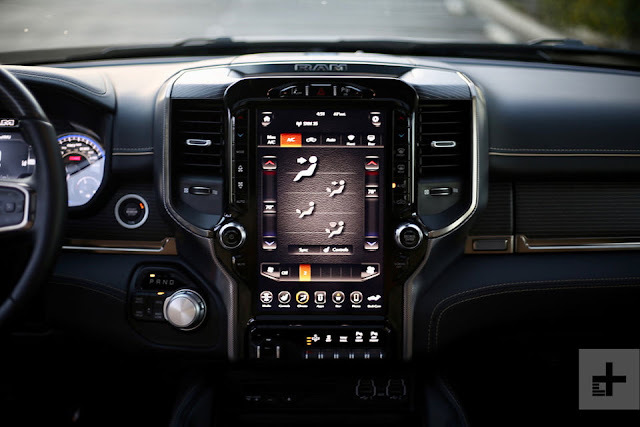 Entry-spec Tradesman and Big Horn models will come equipped with a small TFT display and 5.0-inch UConnect infotainment system, but the most basic equipment group upgrades the center screen to an 8.4-inch unit with Apple CarPlay, Android Auto, and Chrysler’s latest operating system. From there, you can upsize the TFT monitor to a 7-inch unit, add dual-zone automatic climate control, two 115V power outlets, a 400W inverter, heated front seats, a heated steering wheel, and dual USB/USB-C ports. The highest grade 1500 trims bump the center monitor to a massive 12-inch touchscreen that’s nicely integrated within the dash (unlike some tablet-style displays). UConnect 4 is absolutely brilliant, with sharp graphics, quick input response, and smart menus. When controlled through the 12-inch monitor, the system can split mapping and climate control/entertainment on the upper and lower half of the display. Despite the immense real estate, the module’s refresh and response rate remains ultra quick. There are a lot of in-house infotainment systems floating around out there, but Chrysler seems to have mastered the balance of visual intrigue and functional ease better than the rest. Available driver assistance systems are limited by trim, but in the right guise, the Ram 1500 is available with adaptive cruise control, lane departure warning with lane-keeping assist, rear cross-traffic alerts, a 360-degree camera, forward collision warning with automatic emergency braking, and blind-spot monitoring. At present, Ram offers two engine choices in three flavors: a 3.6-liter V6 with eTorque mild hybrid assistance or the carryover 5.7-liter Hemi V8 with or without eTorque. Down the road, a turbodiesel powertrain will enter the mix to rival Ford’s F-150 diesel. Ram’s eTorque system is the product of a 48-volt, 0.4-kWh lithium-ion battery and DC-DC converter, which charges and operates the pickup’s 12-volt electrical system. The belt-driven unit is used to both work the auto start/stop system and replenish the battery under braking. Unlike some hybrids, the power and torque generated is used as gap-fill instead of supplemental performance. In other words, your 1500 won’t suddenly have sports car-like thrust, but it will be smoother and more efficient. The 1500’s cabin volume is on par with vastly more aerodynamic, luxury-grade sedans. Despite similar operation, the eTorque system varies slightly between the V6 and V8 powertrains. V6 models, rated at 305 horsepower and 295 pound-feet of torque, source their unit from Continental and gain 90 lb-ft of torque via the belt-drive. V8 units, pumping out 395 hp and 410 lb-ft of torque, get their electric aid from Magneti Marelli and receive 130 lb-ft. Again, these figures aren’t counted on top of the base engine’s output. The EPA rates the V6 eTorque motor at 20 city, 25 highway, and 22 combined mpg. Adding four-wheel drive drops those numbers by 1 mpg. On the low end, the 5.7-liter Hemi (without eTorque) manages just 15 city, 21 highway, and 17 combined. Splitting the difference, eTorque Hemi models average 19 combined mpg from a split of 17 city and 23 highway mpg. Our test of both the standard Hemi and mild-hybrid variant demonstrates efficient progress within a gas-guzzling corner of the vehicle market. While both powertrains feature imperceptible cylinder deactivation, eTorque also dulls the small jolt of Ram’s stop/start system completely. We expected an abrupt transition between regenerative and friction braking for the eTorque model, but even that was muted. Ram’s eight-speed automatic transmission impresses with smooth upshifts and quick downshifts when more power is needed. One of the biggest hurdles full-size truck makers face when appealing to mainstream customers is providing car-like ride quality. Body-on-frame builds are inherently rougher than unibody counterparts, though Ram has found a workaround. A coil spring rear suspension and active noise-cancelling limit both ride harshness and unwanted cabin noise. The result is smooth driving dynamics and an astonishingly quiet interior. Without embellishing, the 1500’s cabin volume is on par with vastly more aerodynamic, premium-grade sedans. Ram’s long-time foes may be showing points of weakness lately, but they aren’t going to make the path to America’s best-selling pickup easy. Though aging, the 2019 Ford F-150 is still a stout truck with plenty of appeal. A broad range of powertrains, including a 450-hp, 510 lb-ft twin-turbo V6 and a diesel engine good for 25 mpg are among the truck’s strongest weapons. The popular XLT trim in Supercrew configuration starts at $39,420. To get into an F-150 with Ford’s 5.0-liter V8, you’ll need to set aside at least $52,390. Chevrolet’s Silverado 1500 is all-new for the 2019 model year and makes claim to the largest available V8 of its rivals (though not the most power). On the other end of the spectrum, a 2.7-liter turbocharged 4-cylinder notches 21 mpg combined. The Silverado scores points for a spacious cabin and smooth engines. A popularly equipped crew cab model with the 5.3-liter V8 engine starts at $42,190. All Ram 1500 models are covered by a three-year/36,000-mile basic bumper-to-bumper limited warranty and a five-year/60,000-mile policy on the engine, transmission, and drive system. Ram will also tow your rig for free to the nearest dealership. Warranties are fully transferrable. It’s easy to go hog wild with options for the 2019 Ram 1500, and unlike some vehicles, the add-ons really do make a difference. In the case of the Ram, to get the full suite of driver aids, the 12-inch display, and leather seating, you’ll need to pony up for the Laramie edition (starting at $42,290). From there, we’d option the Hemi V8 eTorque ($2,645), advanced safety group ($1,695), and Level 2 equipment group ($4,595) that adds a 19-speaker Harmon Kardon sound system, rain-sensing wipers, heated second row of seats, and wireless smartphone charging. Round it out with the sport appearance pack ($2,495) for body color-matching bumpers and 20-inch wheels, and the 12-inch UConnect system with navigation ($1,295). 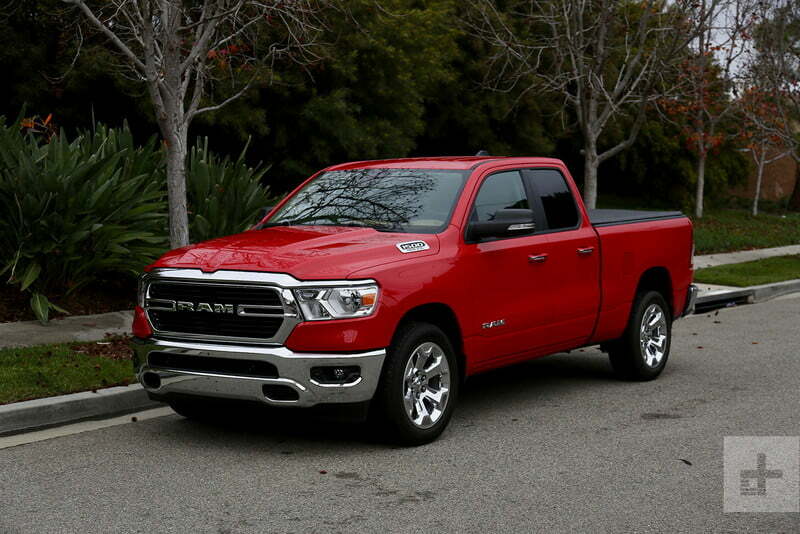 All in, our ideal Ram 1500 is a hefty $55,015.